Attempting to bring us one step closer to a typeless future, Nuance Communications on Friday released version 2.0 of its popular Dragon Dictation app for the iPhone and iPad, adding the ability to send dictated messages to social networking services. The app, which provides voice-to-text transcription using Nuance’s Dragon NaturallySpeaking software, originally allowed users to send their recorded snippets to Mail, SMS, or to iOS’s system-wide clipboard for pasting somewhere else. With version 2, Dragon Dictation has added Facebook and Twitter to that list, allowing you to send a tweet or status update on the go (though for common sense reasons, Macworld does not recommend using this feature while driving a moving vehicle). In addition, SMS messages are now pasted directly into the iPhone client, and dictated text is now auto-saved if interrupted by a phone call. Also new to the app is a “Languages” menu; currently, only American and U.K. English are available, but the company plans to roll out more languages in the coming months, beginning with German. 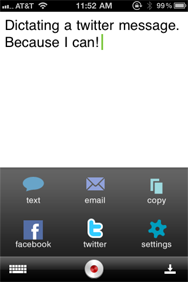 Dragon Dictation is a universal app available for free on the App Store for iOS devices running 3.1 or later.